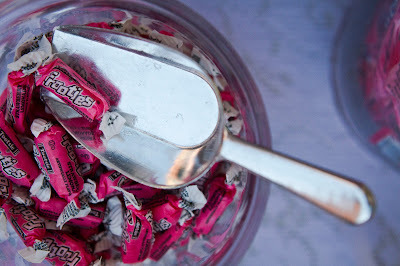 Tootsie Roll Frooties in Strawberry Lemonade- $7.20 for a 360 piece bag: I’ve always loved these little candies. I used to walk down to the mini mart with my brother and we would stock up (they were only a penny a piece back then!) One bag was plenty for our guest list of around a hundred. 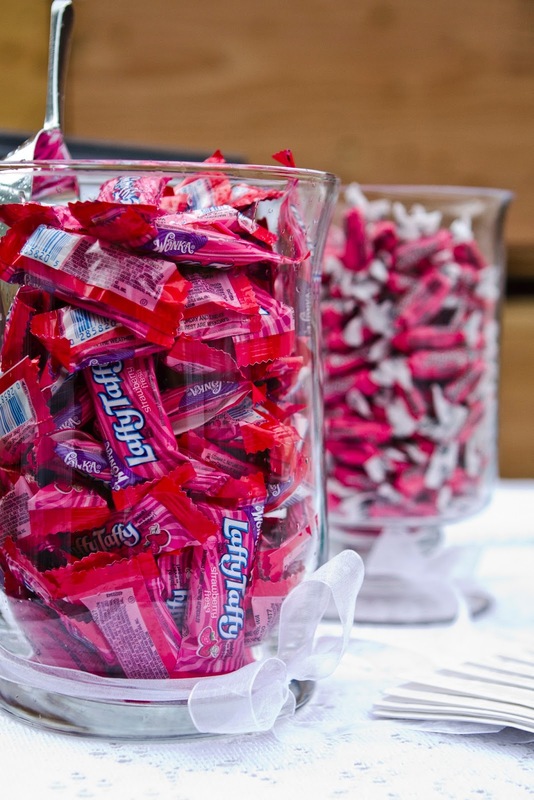 Laffy Taffy in Strawberry- $14.50 for a 145 piece tub: I love Laffy Taffy, complete with a joke on every wrapper. These were a hit! 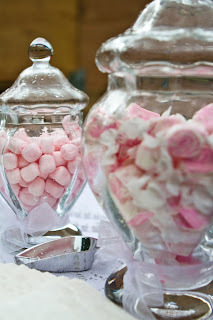 Pink Pillow Mints- $9.90 for a 14 ounce bag (about 350 pieces): What’s a wedding without mints for after dinner? Pink and White Candy Sticks: $12.50 for a 250 piece box: Although these wouldn’t make my favorite candy list, they were too adorable to pass up. Plus, they look like a vintage candy, and my wedding was vintage-inspired. Salt Water Taffy in Strawberry and Creme: $15.00 for a 3 pound bag (about 195 pieces): My husband and I both love salt water taffy, and there are so many flavors to choose from! At the time, we chose this flavor because it was on sale for $12.50- so be looking for deals! 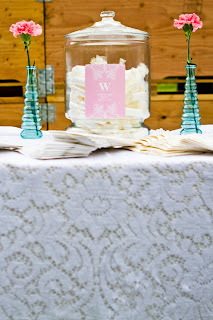 White “Just Married” Candy Rolls- $24.50 for about 150 rolls: I fell in love with these the moment I saw them. They are rolls of white candies that say “Just Married” on them. If you’re wondering what they taste like, they are similar to the white “Smarties” candy- very good, and larger than I was expecting. 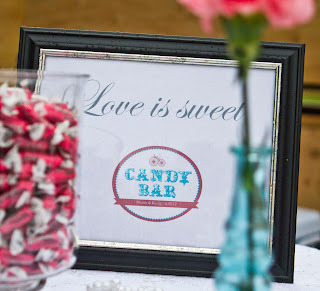 After I purchased the candy, I had to figure out the rest of the candy bar details: bags for guests to put the candy in, candy scoops, jars/ containers, and the table decor. I was able to find the bags and the scoops on Amazon. 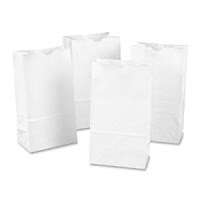 I knew I wanted small white paper bags, nothing fancy. Here is a link to a vendor that has a pack of 100 for $11.69. I definitely had a lot left over. I’m still thinking of projects to do with them! Here is a link to the adorable 2 oz aluminum scoops I found. I purchased two of them, and they worked just fine. They were less than $3.00 each. For the jars, I lucked out. My sister-in-law had a set of two lovely apothecary jars with lids that she let me use. My mom also provided me with a large jar, and I purchased some inexpensive hurricane vases from Ross for the rest. The candy bar decorations were simple. 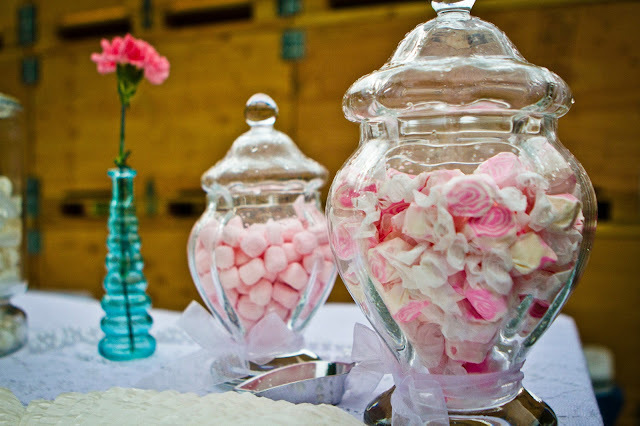 I used blue vases from home, and we put a single pink carnation in each of them. 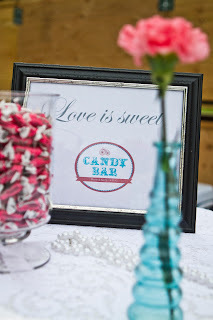 For the “candy bar” sign, I used a free printable from Wedding Chicks. Their website is fabulous, and they have so many great free printables where you can pick the colors! Here is a link to the printable I used. I framed it in a $1.00 frame, and was so happy with how it turned out! The “love is sweet” was a touch I added myself. 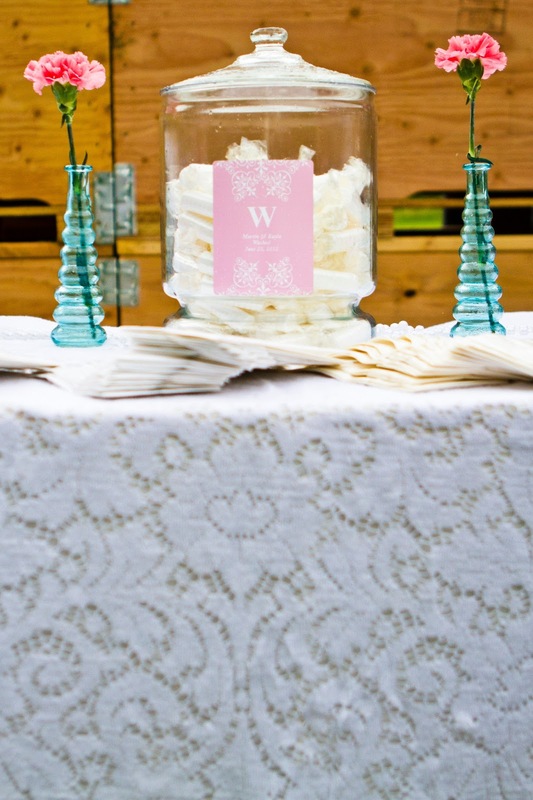 I am so happy that this is something I included in my wedding, and I adore how it turned out. 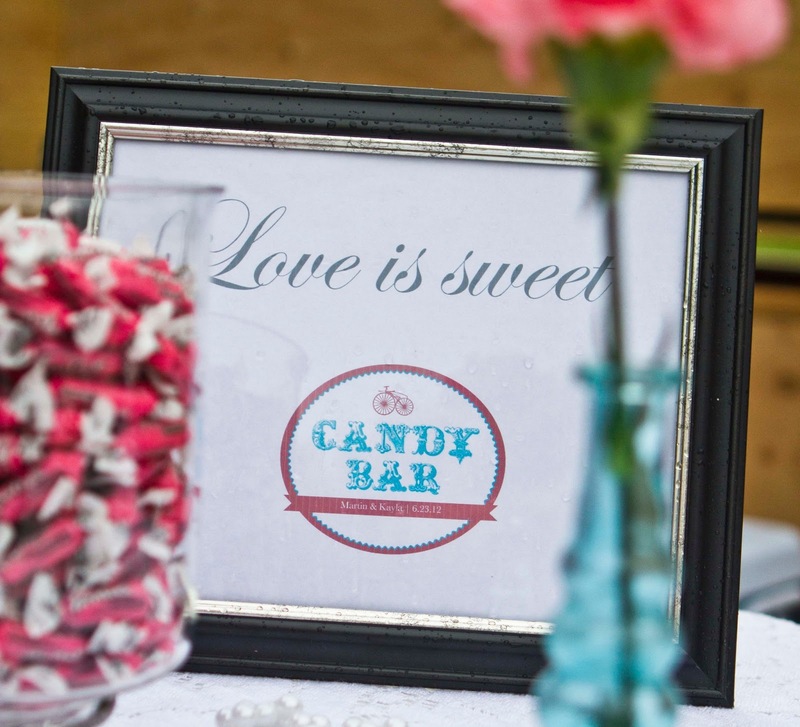 If you’re considering a candy bar, it’s a great option- especially for those on a budget!